Over the years, I have seen a lot of movies that were successful that are largely bits and pieces of ideas. There is so much crap out there that a certain amount of it is likely to draw flies if it meets some minimal elements demanded by today's audiences. The last three "Pirates of the Caribbean" films are all gassed up by the presence of Johnny Depp in the role he has played so perfectly. I myself am willing to give into a sloppy film if there is something about it that I can hang onto. Those kinds of movies come out nearly every week and they drain my wallet almost as often. I can't begrudge the machine it's due too much, since I am a willing participant at times in feeding it, despite the fact that it is delivering inferior entertainment. That mea culpa aside, I get incredibly frustrated when the opposite happens. Good and even great films get ignored by the movie going public way too often. Sometimes it is because they are small films that will need to be sought out. Very often it is the marketing of a movie that keeps people from going to see a movie that is worth their time. Once in a while, it might be that a great film has a tough subject matter that people can simply not wrap their head around. Today however, we have the most frustrating of all such experiences. A movie that has been marketed well, is available on all your local theater screens, and has a setting that is widely popular in the culture; mixed martial arts.Despite these things going for it, "Warrior" is likely to be out of theaters in another week, and hoping to do some bushiness on video. This is one of the two or three best films of the year. It is a high quality production which tells a solid dramatic story, and it is told in a crowd-pleasing dynamic manner which should have people lining up to see it. Instead, Amanda and I saw this in a nearly empty theater. Three other people came in just as the movie started so five of us got to enjoy it together. I don't think the movie would be better if more people were there, but the experience would have been terrific if the audience was packed. There are moments of high drama, tension, and an occasional light humored touch that would all go down together as a collective moment if more people were there to share it. I really wanted to stand outside the theater after the movie and tell everyone who was buying a ticket to something else this weekend, to open their eyes and go see this film. This is ultimately a story about the redemption of a family, not just a single character. We know what has happened and we largely know who's fault it is. In another movie, that characters story arc would be the main focus. Here, we see some of that characters attempts at making things right, but we are not lead to feel that his restoration is the key element of the film. Nick Nolte has aged, and not entirely well. His skills as an actor are used well here and I suspect that his performance will be remembered at the end of the year, even if the film is not. Yet, it is a testament to casting as well as acting that makes him so perfect for the role. His beefy frame, and bloated facial features, are a perfect match for the character and circumstances. There are strong themes of family, responsibility, determination and country in the movie. There were moments when I could not keep my face dry, and there were moments when I would have wanted to engage in the same kind of smackdown with some of the characters that I saw on screen. There is so much anger in the characters that it might seem like the movie is going to be unpleasant, and then a moment of tenderness shines through. All three of the main characters go on a journey in the story. It has many traditional elements that any sports story would have. The best sports movie however are rarely about the accomplishment in the big event at the climax of the story. The best sports movies are about the challenges that the character faces, the demons that drive them, and the ways in which they try to reach their goals. If "Rocky" had just been a boxing movie, no one would remember it today. If "Miracle", had only been about hockey, I would never have seen it. 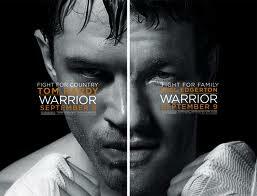 Warrior is a Mixed Martial Arts movie, the same way that "Pride of the Yankees" is a baseball film. If the idea of Mixed Martial Arts is what has kept you out of the theaters, KNOCK IT OFF!!! This is a film that is much more than some kickboxing Jean Claude Van Dame crud. Let's all celebrate that a real movie has sneaked into theaters and see this while you have the chance.